Fine Jewelry –is a precious possession that is designed and crafted to last a lifetime. However, proper care is required to assure the lasting qualities of your jewelry. Don’t jumble your jewelry pieces in a drawer or jewelry case. Pieces can scratch each other. Be careful when removing your jewelry to wash your hands. Do not leave your jewelry on the rim of a sink where it can easily slip down the drain. There are many types of small machines on the market that will clean jewelry in a matter of minutes using high-frequency sound. These machines are called “ultrasonic cleaners” and are available in many different models and prices. They can be a convenient way to quickly clean your jewelry at home. However, ultrasonic cleaners can damage some jewelry. Your local jeweler can tell you if an ultrasonic cleaning machine is right for your jewelry wardrobe and, if it is, recommend an appropriate model. Diamonds – Diamond jewelry is very popular. Some pieces, such as diamond engagement and wedding rings, are often worn 24 hours a day. Even though you may wear your diamond jewelry around the clock, you should give thought to its care. Diamonds are durable, but they still require proper maintenance. Diamonds can get smudged, soiled and dusty. Lotions, powders, soaps, even natural skin oils, put a film on diamonds and cut down their brilliance. Clean diamonds “glow” because the maximum amount of light can enter the stone and return in a fiery brilliance. It takes just a little care to keep them that way. Colored Gemstones – There are many different types of colored gemstones, some of which require specific care and cleaning procedures. It would be impossible to enumerate all of them in this brochure. However, there are some general care and cleaning rules which apply to all colored gemstone jewelry. Consult your jeweler for the best cleaning procedure for your particular gemstone jewelry. Your jeweler is also a good source for any information on colored gemstones. Karat Gold Jewelry – Karat gold jewelry pieces make up the majority of many fine jewelry collections. Gold comes in many different styles and colors, but the care and cleaning procedure remains the same. To clean your jewelry at home, you’ll find many commercial cleaners available. In addition, you will find a soft chamois cloth an effective and inexpensive way to keep your pieces lustrous and shining. Ask your jeweler to recommend both of these items for you. Platinum – Platinum is one of the rarest and most durable precious metals. It is resistant to tarnishing and discoloration due to chlorine and other chemicals. These factors, along with its strength and white luster, have made platinum an increasingly popular choice for jewelry, either on its own or as the setting for diamonds and other precious gemstones. However, despite its durability, platinum jewelry needs to be properly cared for. Signs of wear such as scratches can eventually appear on platinum. However, due to the metal’s durability there is usually little metal loss from the scratch. If visible scratches do appear, your jeweler should be able to re-polish the piece. Sterling Silver Jewelry – Sterling silver, like other precious metals, can oxidize with time. But properly maintained silver jewelry improves with age and develops a lush patina. Treat your silver well, care for it properly and it will reward you with a long life and a lustrous look. Store your silver in a cool, dry place, preferably in a tarnish-preventive bag or wrapped in a soft piece of felt or cloth. Store pieces individually so that they don’t knock together and scratch. Make sure your silver is not exposed to air and light during storage _ this can cause silver to tarnish. And don’t wear sterling silver in chlorinated water or when working with household chemicals. 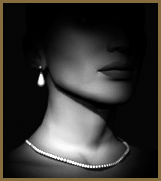 Cultred Pearls – Cultured pearls are precious jewels and should be treated as such. They’re also the products of living creatures. Cultured pearls are formed when an irritant is introduced into a mollusk. The mollusk secretes a substance called nacre which covers the irritant and produces the pearl. Nacre gives pearls the rainbow of colors and luster that makes these gemstones so treasured, but its delicate nature also makes pearls particularly susceptible to damage. For this reason you should be extra careful with your cultured pearl jewelry. When you remove the jewelry, wipe it carefully with a soft cloth to remove any traces of these substances. Do not toss your cultured pearl jewelry carelessly into a purse, bag or jewel box. A pearl’s surface is soft and can be scratched by hard metal edges or by the harder gemstones of other jewelry pieces. Cosmetics, perspiration, oils and ordinary wear weaken and stretch the threads on which the pearls are strung. Apply cosmetics, hair sprays and perfume before putting on any pearl jewelry. Make certain the pearls are strung with a knot between each pearl. This will prevent loss of pearls if the string should break. 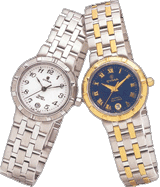 Watches – Watches need the same amount of attention as fine jewelry. Fine watches are sophisticated and precise pieces of equipment; the price often reflects the skilled workmanship that goes into a fine timepiece. In order to get the most satisfaction out of your watch, you should follow some simple care and cleaning guidelines. Where to Go for Care and Cleaning – To make sure that your fine jewelry and watches are properly cared for, take them to a professional jeweler, someone you can trust. Choose a retailer who has been serving the community for a number of years and has an established reputation. Ask if the jeweler is a member of Jewelers of America, the national association for retail jewelers. Or look for the “J” mark on the door. 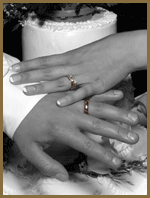 JA jewelers are knowledgeable and they offer a wide range of services to care for your fine jewelry. Your JA jeweler will not only help you properly maintain your jewelry but will also answer your care and cleaning questions and help you with your purchases, repairs and custom design.